In Melbourne, there’s a common subculture within a few of the inner-city suburbs, Hipsters. 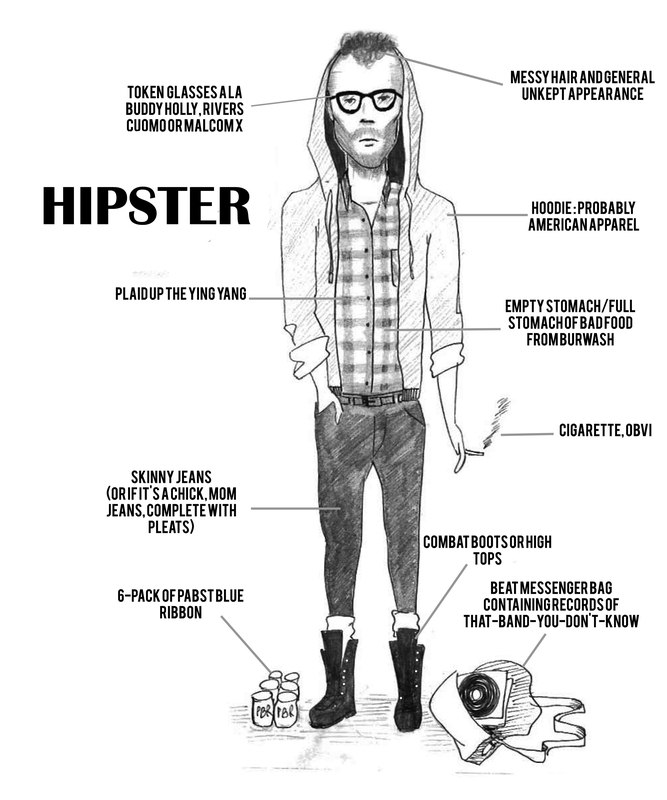 People who belong in this hipster category are concerned with their appearance substantially more than the regular person. Often they feel that they are “unique” and have an “alternative” vibe to them. It’s almost oxymoronic though as this expanding subculture seems to be rather homogenous amongst themselves. As The University of Melbourne is located close to the hipster hot-zones of the inner northern suburbs of Melbourne, it’s often quite common to see students that fall within this grouping. Most seem to be Arts or Science students however you’ll occasionally come across them from other courses. One way to stand out from the other hipster guys without getting an even more depressing tattoo or being in some loser band is to have some muscles. Hipster dudes are frail with Holocaust style concentration camp bodies, so having a more athletic build—that your v-neck will undoubtedly highlight—will do a better job of being slightly unique within a largely homogenous grouping. Just don’t be jacked because hipster chicks don’t like that. Even though hipsters are obsessed with their look, making sure each strand of hair is strategically placed across their face, the trick is making it seem like you don’t really care. It’s tough but once you pull it off, you’ll know how it really feels to be a true hipster. It’s odd, hipsters try hard to emit a care-free ambiance, however they are often some of the most self-absorbed people around, especially in a city like Melbourne. Walk along Smith Street and Brunswick Street and you’ll see exactly what’s written here! hate them loser brunswick types who are always bitching and complaining with their leftist views. Your right Amanda I was talking to some while shooting a music video in the area. This group of Fitzroy Hipsters sat a table in the cafe we were shooting the clip at. While setting up they told me they all shared a low rent gov’t house received oZ study or dole were all going to uni and swore they’ll never repay student loans. The rich were all war mongers,the banks were all Iluminati. They asked about me and I said I owned a video production business doing this sort of thing. They complained I should make films about homeless, Aboriginee’s etc. I told them I worked 2 jobs to buy all this gear and needed a return to upgrade when outdated and live. They informed me that’s why the systems stupid and the state should own the cameras and employ people to shoot important issues. However when viewing the band I shot the clip for on a large monitor they wanted me to shoot a doco on some friends of theirs who bought those 4 wheel granny prams once used to do shopping in. Their friends totally rebuilt them and covered them in grafity and other bohemian artwork. I took their numbers but never dared to shoot it or call them. I’m going to get 12 random tattoos and become a hipster now!! Reblogged this on It's Tagle..